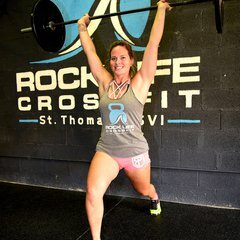 Our coaches and members consider Rock Life Crossfit to be a second home. We believe that CrossFit training is the best physical training regimen for building a better you. 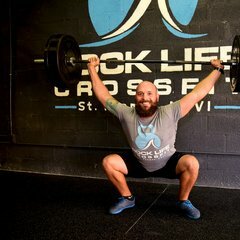 Tygue is a co-owner of Rock Life CrossFit, L1 trainer, and spends his off time up in the front of the house as one of the doctors at Rock City Wellness. Using the information learned throughout his decades of schooling (maybe it only felt that way,) Tygue stresses keeping members strong and safe through both new and comfortable movements. Understanding that knowledge of anatomy is critical for any successful coach, he and Tylur spend a weekend every other month working coaching development to share this information with the team to make them the best, most knowledgeable team possible. 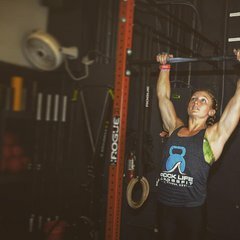 While in College at Western Kentucky University Paige taught a variety of Group fitness classes and in 2012 when her Professor took her Strength and Conditioning class on a little field trip to CrossFit Old School she first experienced CrossFit. From this day on she was hooked. She obtained an internship with them and in Spring of 2013 she earned her Bachelors degree in Exercise Science. From her fitness experience, upon graduation she was hired as the Fitness Graduate Assistant at Mississippi State University’s Rec. Center where she earned her Masters Degree in Sports Administration in Fall of 2014. She looks forward to seeing everyone give their all in every class and helping them reach their fitness goals. Coaching is my paradise. I have been involved in coaching one way or another with different forms of exercise since I was 16 years old. I began just training family members at a local power lifting/body building gym in Virginia Beach. Then as I moved on to college, I trained friends, dorm neighbors, and outside clients. After college I found Crossfit and I have enjoyed the constant gaining of knowledge that it offers, and also the perks of becoming stronger, faster, more efficient in everyday activities. After about 6 months of CrossFit, I got my Level 1 training certificate and immediately started coaching. I soon became the manager and a head coach of a box. I was fortunate enough to coach along side two of the best coaches I have ever met, and learned so much from both of them. From Crossfit I became a big fan of Olympic lifting. I began studying and then had the opportunity to work in the same building as Olympians and Olympic lifting coaches--Literally, the best in America. I was able to pick their brains, watch their meets and workout with them. Taking classes with these individuals was an amazing experience. 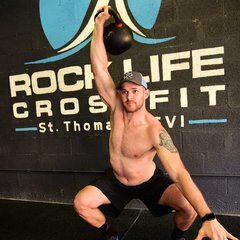 I took multiple non-certified Olympic lifting classes and also got a certificate in Crossfit Football, which broadened my horizons much further than I expected, because of their focus of explosive movements. What I enjoy the most about coaching at Rock Life Crossfit is giving people cues, tips, suggestions, and watching them gain from it. Seeing a smile on a members face and knowing I helped them reach a goal is my ultimate reward as a coach. If you have any doubts as to your abilities in fitness, please understand that we are all in this because we enjoy it as a challenge. Come speak to one of the coaches here, and we will help you feel at home and comfortable in the environment. Everyone is challenged in their own ways each day as they walk into the gym. The best part is that we all want to see each other do better, and reach those goals... together as a community. We are all here to cheer each other on. Looking forward to meeting you soon! Based on his wisdom and experience it is speculated his origins go back thousands of years , though no one knows for certain. Many assume he was born with two hearts giving him twice the love of an average human. 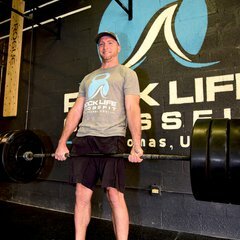 He’s been involved in Crossfit since 2004 and it aided him walking on to his college soccer team years after high school. 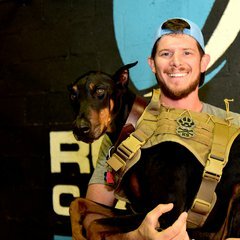 Jared started coaching sports as a high school student and has continued to teach movement and fitness in both soccer, Crossfit, and personal training the 15+ years since. I remember my passion for fitness starting as young as 14 years old; when I walked into a Gold’s Gym for the first time. Most of my adult fitness life was spent in traditional style gyms, where I would workout anywhere from 45mins to 3 hours, 4-6 days a week. During this time, I only made a few gym friends, spent most of my time with my headphones on; isolated and quite frankly bored. I had my routine, my schedule, and my independent workouts. Not only was I bored, I wasn’t seeing great results. Then in August 2012, it happened, a break from the cycle. Once I found Crossfit, I knew I had found not only my passion but my fitness home and a second family. Every WOD leaves me wanting more, knowing I can do more and having a community standing behind me the whole way. CrossFit is more than just a gym. It only took me ONE year of attending classes to realize I wanted to make CrossFit a bigger part of my life. In August 2013, I quit my job and took my love for Crossfit to the next level by becoming a Level 1 Coach. In addition to coaching, I have helped open a brand-new box, managed a box for 4 years, remodel and expanded a box, have organized as well as participated in several Paleo and fitness Challenges, performed in the Crosfit Games’ Opens, completed 3 half-marathons, competed in a tough mudder, all while training under some of the best Crossfit Coaches. I believe fitness should be a well-rounded sport and as long as you are moving I’m happy! I have the CrossFit Level 1 Certificate, CrossFit Kid Certificate, CrossFit Gymnastic Certificate, USA WeightLifting Certificate and will be completing my CrossFit Level 2 Certificate in the Fall of 2018. Fitness is my passion, Crossfit is my lifestyle.